For those of you out there who have been practicing yoga for awhile, how often do you take a beginner yoga class? You know, the ones labeled as “Yoga Basics”, “Yoga 101”, “Yoga Foundations”…something like that. I have to admit that I don’t take them very often. It feels like I barely have time to get in my own practice, so when I do, I usually feel like I’ve got to do some sort of Power or Vinyasa type of class. Or, if I’m having a day where my energy is low or my pain level is high, I find a Deep Stretch or Yin class. But last week, after teaching a Vinyasa Flow class, I stuck around for the Yoga Foundations class. I knew I would be subbing it this week, so I wanted to stick around and see what kind of students were coming, how the teacher taught, etc. However, I soon got lost in what my body and breath were doing, and it was amazing! Amazing to see how sloppy I’ve gotten in my practice, for one thing. When I’m in a flow-based class like Power or Vinyasa, sometimes it’s hard to really refine my alignment because we move so quickly from one pose to the next. In this Yoga Foundations class, we really spent a lot of time making sure everything was aligned properly and that all the right muscles were doing what they should be. I quickly realized how much I’ve been using momentum to power me through poses for quite some time. And I also could see how weak my core has become, as holding Plank really made my back tired. Many students and teachers I know say they regularly attend some sort of beginner’s class, and I think that’s great. As a matter of fact, I need to start doing it myself, as I really felt amazing after that class (of course, having such a great teacher made it even better). If you are new to yoga, then I beg you to please make sure you attend at least a few basics classes before jumping right in to styles such as Power or Vinyasa. It really is so important to know the proper breathing and alignment. 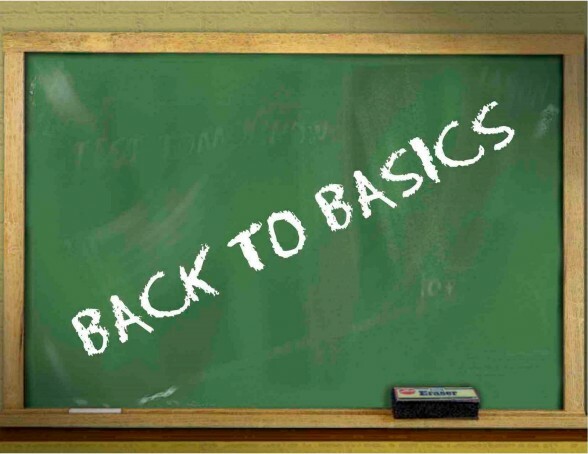 If you have been practicing for awhile and consider yourself an intermediate or advanced yogi, then I urge you to attend a basics class now and then. I think you’ll find that you will learn something new, no matter what the pose or how long you’ve been practicing yoga. In my classes this week, we’ll be working on creating and building a strong foundation. To me, the foundation is where it all begins. In each pose we do, we’ll be breaking down exactly where the foundation is. It could be the hands, feet, or a variety of other body parts, depending on the pose. Wherever it is, we’ll be striving to find that sweet spot…that place where we feel grounded and balanced. When we can achieve that on our mats, it will spill over to everything we do in our lives, creating balance in our entire being. June 26, 2013 in Health | Enter your password to view comments. Wait a second, did you just say, “the beach”? You mean, I’ve got to put on a BATHING SUIT! Now, before you get all huffy on me and have a panic attack, this blog entry is not going to be me preaching about how you should be “working your core” or doing tons of Chaturangas so that you can achieve that bikini body. No, this blog is to remind you that no matter what, you must have a positive perspective. Remember, we practice yoga for peace of mind first. Which generally tends to provide us with improved health. And then maybe, by accident, we end up with a better body. But having that better body should not be your main priority. We need to love ourselves just as we are in the present moment, warts and all. This means we must find the positive in everything we do, AND in how we look. I just finished reading “The Paleo Coach”, by Jason Seib. I know what many of you must be thinking right now. “What? She’s a yoga teacher and she eats MEAT?? What the heck? !” Well, before you get all judgmental on me, this blog is not about how to eat. With the health issues I’ve been dealing with for several years, I have found that eating Paleo works for me. Enough said. You eat in the way that is best for you…I am not here to judge. But I bring up this book because Jason does a wonderful job at pointing out that mindset is what it’s all about. You’ve got to WANT change and be motivated, or else you will never succeed in having the life you are meant to have…the life you deserve to have. This means you’ve got to have that peace of mind from the beginning, and then comes the better health, and all the rest. How many of you out there get frustrated in your physical yoga practice? I’ll be the first to admit that I am prone to berating myself when I can’t do poses I used to be able to do. Many are simply too painful for me right now. It’s sometimes hard to look around the room at all the people who CAN do what I can’t and not get a little envious. But you know what? I am able to move. I can still do yoga. I still am able to participate in class, and I modify where I need to. I’ve had to work at it, but now when I am on my mat, I really am able to tune everything else out. Instead of worrying about how I look, or what I can’t do, I now just focus on what I AM able to do. I remind myself how beneficial this practice is for my overall wellbeing. It’s truly helped me through many things. I try to find something positive in each and every pose that I make my way into. It’s crucial for me to do this, because otherwise, I’d end up leaving my mat feeling empty and bitter. Which is so NOT what yoga is all about. So as you find your way to your yoga practice this week, try and let go of any barriers you’ve created around yourself. Love yourself enough to know that you deserve the best in life. And then approach your yoga practice in a way that honors that. Don’t be afraid of what you think you CAN’T do. Instead, relish the things you CAN do. Accept where you are. Right now. In this moment. In last week’s blog, I talked about staying committed to your practice, and that we can use the obstacles we are presented with as stepping stones. It seemed like as soon as I posted that blog, more obstacles were thrown at me than I was prepared for, and I have to admit that it was hard not to let my frustration get the better of me. It was really challenging to think of these “kinks” as opportunities. I had to look REALLY hard in order to find SOMETHING good in all of it. So I decided that this topic needed to be explored a bit more. After all, I’ve talked with many of you over the years, and I know I am not the only one out there who is constantly being tested and challenged to make my way through my journey in the most beneficial way. Not too long ago, I started doing more studying on the myths and legends that yoga bases a lot of its philosophy on, and the story of Ganesha really stuck with me. And this past week, I found myself reading his story again (or at least one of them…he is in many stories), as he is known as the Remover of Obstacles. Ganesha (also known as Ganesh or Ganapati), is the elephant-headed, pot-bellied, Hindu God and he is thought to be the most beloved God in Hinduism. I know I love looking at pictures and statues of him, because he always seems so happy and full of joy. He is believed to be all-loving, no matter what religion you are, as long as you take the time to make a connection with him. You’ll notice in the picture above that in his upper right hand, Ganesha holds a goad (an elephant prod), which helps him propel mankind forward on the eternal path and remove obstacles from the way. After all, he had his head chopped off by Lord Shiva (his own dad! ), who didn’t realize who he was. But once he realized what he’d done, Shiva restored him to life by attaching an elephant’s head to his body, and named him the lord of new beginnings (remover of obstacles). 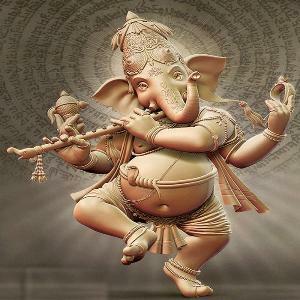 So if anyone knows about overcoming obstacles, I’d say Ganesha is the one, wouldn’t you? If you’re into chanting, you might try repeating the mantra at the beginning of this post several times. It’s one of many mantras devoted to Ganesha, and is thought to be very helpful when obstacles seem to keep getting in the way. Personally, I am going to give it a go…I can use all the help I can get!